Beetroot Juice, Cordyceps & Reishi Super-Blend Powder - 70g. A pre-workout powdered blend combining fresh freeze-dried Beetroot Juice & Greens, Cordyceps Mycelia, Reishi Mycelia and Wheatgrass Juice with Ginger and Cayenne. As a food supplement for adults, take 1 teaspoon (approx. 5g) approximately 60 minutes before exercise mixed with juice or water. Do NOT use if suffering with bipolar disorder. Do NOT use if taking prescribed antidepressant drugs unless on the advice of a physician. 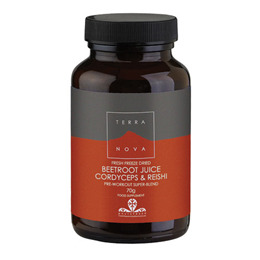 Below are reviews of TERRANOVA Beetroot Juice, Cordyceps & Reishi Powder - 70g by bodykind customers. If you have tried this product we'd love to hear what you think so please leave a review.